A power couple! A born showman and a savvy business woman. These joint forces are personified in the form of married couple, Osman Osman and Shaaista Khan Osman. Combining their expertise, experience and enthusiasm as the two pillars of lifestyle and management brand, Blu Blood, this pair is set to achieve more victories in their company’s various fields. Having had to overcome many hardships and speed bumps growing up, Osman has never been afraid to grab an opportunity when a challenge arises. With a Diploma in International Management Marketing and aspirations to complete his Law Degree, Osman proclaims the business and local surround of his upbringing has been the best university that he could ever attend. Osman believes “learning from others’ mistakes and experiences can ensure your own success”. Osman has worked in both the business and entertainment sectors and one of his entertainment highlights includes being part of the hit local movie, Material. Starting out with a humble upbringing as the youngest of six children, Shaaista’s story is true testament of hard work and dedication. With her strong feminine healing side, she has successfully completed studies in Naturopathy and Naturology. Furthermore, she has dabbled in Law, Psychology and Theology. Shaaista has also successfully completed a Diploma in Project Management and Labour Law from the University of Cape Town. She pioneered Blu Blood in 2008 and has had many achievements of note since then. Shaaista proclaims that it is up to the individual to “seize every opportunity, own each day and sculpt your own brilliance”. A sweet story of fate brought Osman and Shaaista together. The couple met at a mutual friend, neither of whom had heard of the other nor ever met before, although having both lived in Laudium (in central Pretoria) for years. Shaaista was hosting a Childline Gala Women’s Day Luncheon on the night of their meeting, and Osman, being his charismatic self, insisted he would assist this worthy cause. This chance experience led to the two becoming fast friends and not to long after, love was in the air. The couple is now happily married and has combined forces to take Shaaista’s business venture, Blu Blood, to new heights. The Osmans realised that the best way forward would be for Osman to join Shaaista’s Blu Blood venture, instead of them both working on separate business entities. Shared interests and mutual passions made this a decision they haven’t regretted since. Blu Blood embodies lifestyle and management in the various services they offer. Their mission is to be a worthy competitor in the lifestyle management field in terms of promoting, managing and showcasing events and entertainment. 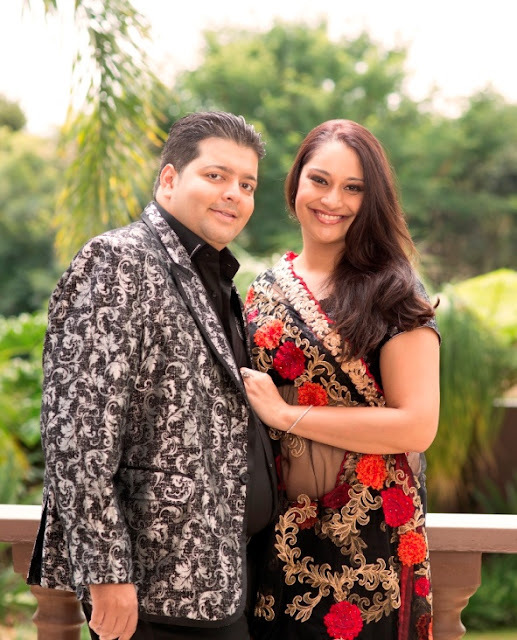 Osman and Shaaista believe in thinking out of the box, to create a tailor-made service for every client they work with. With over 10 years’ combined experience in marketing, communications, hospitality and logistics, Blu Blood aims is to offer a service that is above and beyond every client’s expectations. Blu Blood offers a variety of services from unique bespoke packages, to exciting launches of new products and events. They have worked with many large companies including Nedbank Golf Challenge, Telkom Corporate customer form, Chats Cellular,Sun International,Peermont At Blu Blood personalized service is key and paramount to business success. Blu Blood is known for their professional event management work, which includes events for Bollywood Indian Cinema, as well as music industry promotions throughout South Africa and Africa. Other than that, Blu Blood has successfully completed the custom-made task of creating and facilitating the coordination of the UNICEF Child Friendly Space at the 2010 World Cup FIFA Fan Fest Sites throughout South Africa. Continuing their good work to promote the protection of women and children in South Africa, they were the marketing and sponsorship consultants to The Childline Johannesburg Centre. Blu Blood has crossed paths and collaborated with many renowned artists, such as Riaad Moosa, Azhar Usman, Preacher Moss, Mo Amier, Russel Peter, Joey Rasdien, Conrad Koch, Marc Lottering, Loyiso Gola & Nik Rabinowitz to name just a few. Their festival and event experience include Hollywood A-lister actor & comedian Orlando Jones’ Stand Up & Laugh with Orlando Jones, US-based and award-winning theatre production, Mystic India, Riaad Moosa’s The Best of Tour and Doctor’s Orders Tour, Joey Rasdien’s Mixed DNA, The Kings and Queens of Comedy and various other tours. On the Bollywood side, Blu Blood has toured with Sonu Nigam, Atif Aslam, RAHAT Fateh Ali Khan, the International debut show of Arijit Singh, Mika Singh and many more. They are the exclusive management team for Riaad Moosa, Tumi Morake and Simmi Areff.